International cars took center stage on day two of the 14th consecutive Greenwich Concours d'Elegance. Just like with day one (featuring American cars), day two was blessed with nice, warm weather. Over 150 vehicles were carefully arranged on the show field and offered a wide variety of sheet metal to impress the un-ending stream of onlookers throughout the day. From the large and stately pre-War cars from Renault, Alfa Romeo, and Lagonda to competition Porsche, Lola, and Ferrari models, the list of cars was as vast as it was diverse. The pre-War cars were among the finest and most elegant machinery on the show field. A pair of Lagonda's sat side-by-side just like the pair of Bugatti Type 37 racing cars parked a few feet away. The 1914 Renault was, perhaps, the most unique on the field; it received much attention throughout the day and was ultimately crowned 'People's Choice' as their most favorite vehicle in the show. Sitting just a short distance away from the Renault was an Alfa Romeo 6C 2300B. It had a similar body style to the Alfa 8C that won last year's Pebble Beach Concours and later earned top honors at the recent Villa d'Este. Granted, the 8C has a larger engine and a different history, but with similar proportions, design, and beauty, it was certainly a contender for Best of Show honors. As with most concours events, there were several categories reserved for sport, GT, and competition cars. Ferrari and Lamborghini occupied many of the spots in these two categories, with Porsche and Lola accounting for several of the cars in the Competition group. There were nearly a dozen Aston Martin vehicles on display, with the earliest example being a Short Chassis from 1934. The newest car on display was from 1999, the Aston Martin Vantage Le Mans Coupe. It is one of just 40 LeMans coupes ever built and one of only 2 known to be in the United States. Sitting directly in front of this car was an equally impressive and rare model, a 1998 Lamborghini Diablo SV Monterey edition. It is one of just 20 created and it originally sold for nearly $300,000. The concours had a nice selection of Rolls-Royce and Bentley cars to admire, especially the recently restored Franay bodied Mark VI. There were two Silver Cloud Estate Wagons which offered a rare glimpse of luxury cars performing the duties of a station wagon. There were several gems scattered throughout the field, including the seldom seen craftsmanship of Neri & Bonacini. This small, lightweight car shared its day sitting in a corral of Ferraris. Aligned next to a pair of Volkswagen Beetles were the Wendler and Rometsch Specials. Both of these rear-engined cars were hand built with only a few examples surviving in modern times. The Wender resembled a Porsche but built on a Volkswagen chassis. The Rometsch followed a similar philosophy, built on a Volkswagen chassis and typically fitted with Okrasa or Porsche engines. The Sabra was born when Autocars, an Israeli firm, commissioned Reliant, a British car company to build them a sports car. The Sabra Sport was to be sold as a new entry in the growing US sports car market in the early 1960's. Total production is estimated at 208. In honor of Morgan's Centenary there was a special ring of Morgan automobiles that included many models from the company's history including the early Aero Super Sports, Plus 4, and Plus 8s. German representation was very strong from marques such as BMW and Mercedes-Benz. The BMW models were mostly from the recent decades of 1970 through the 1990s. The most exotic in the group was the M1 coupe. Many of the Mercedes-Benz models were from the 1950's and 1960's, offering onlookers the opportunity to see the evolution of the marque in the early post-WWII era. The Best of Show for the American concours was a bit of a surprise, when the Auburn was chosen over the pair of Duesenbergs. With a long list of well-qualified judges, it is obvious they did their homework and thoroughly inspected the cars, resulting in a well deserved win for the brightly-colored Boattail Speedster. The Best of Show on day two was nearly as difficult to forecast as on day one. The aforementioned Alfa Romeo 6C was certainly elegant and deserving of the award. The Franay-bodied car, though built in the post-WWII era, was another healthy contender. There were two exotic Lagondas, a stately Rolls-Royce Phantom II, and a sensational post-WWII Delahaye 135 Drophead Cabriolet Coupe with coachwork by Figoni & Falaschi. 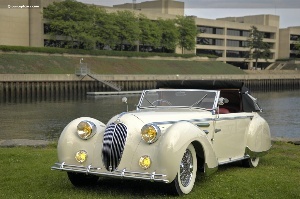 After careful consideration and scrutiny, the judges selected the Delahaye 135 as their favorite. This post-war Delahaye 135 Cabriolet continued the esthetic standard set in the 1930s by Figoni & Falaschi. Sweeping fenders and curved shapes abound, with wonderful interior woods and fabrics to compliment its 'French Vanilla' exterior. It has recently completed its restoration and was shown at the 2006 Pebble Beach Concours d'Elegance. Bonhams auctioned off their impressive lot of automobiles in an auction tent that was within sight of the concours. Highlights from the auction were Clark Gable's Packard Darrin, the Rolls-Royce driven by Robert Redford in The Great Gatsby, President Woodrow Wilson's Rolls-Royce Silver Ghost, and racing legend Fitch Whitmore's Le Mans Special. The sale featured the Ted Leonard collection, a man who prized himself on acquiring exceptionally fine motorcars with celebrity pedigree. The top lot of the sale was a 1934 Bugatti Type 57 Stelvio Drophead Coupe, which sold for $419,500 to a European collector. 'Collectors recognize that it is rare to see cars of this caliber, and history assembled in one sale, and the bidding action certainly demonstrated keen interest from around the world,' said Rupert Banner, of Bonhams Manhattan Motorcars department. Bonhams offered 89 automobiles for sale, with 44 finding a new owner, reflecting a 49% sales rate. Total sales volume was $4,405,800 and the average price per car sold was $100,132. The plethora of automotive excellence that was shown at the Roger Sherman Baldwin Park, in Greenwich, CT was truly of high caliber. Including the auction and the two day show, there were nearly 400 automobiles on display. Spectator attendance remained strong, the weather cooperated, and the event functioned like a well-oiled machine.